Ananka's Diary: The Most Amazing Dollhouse . . . Ever! 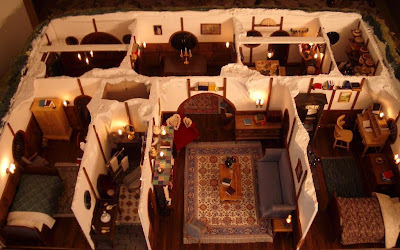 An unnamed artist recently built a dollhouse that's an absolutely perfect copy of the Hobbit's house from Lord of the Rings. I've never seen such incredible detail--there are even tiny eggs and and bottles of wine in the pantry! Check out the "Hobbit-eye views" here. my brother wants that SO bad! that looks like it took a LONG time to make, but their efforts were rewarded! that is just spectacular!